If you are a true shotgun enthusiast, then you probably know that Beretta is one of the best manufacturers of quality shotguns. Whether you prefer well-designed pieces with incredible detail or budget guns that offer you the best value for your money, Beretta has got you covered with their wide selection of shotguns. They have a full catalog of guns for every purpose including waterfowl hunting, personal defense, clay target shooting, and law enforcement. Since there are so many Beretta shotguns out there that look the same, you might mistake one for another. But don’t worry, we’ve gone through them and picked out the top five for you. All you have to do is read and pick your favorite. With all Beretta has to offer, it was hard to whittle it down to five, but we did it, and here they are, in no particular order. The Beretta A400 Xplor Unico is a gas operated semi-automatic shotgun appeared on the market in 2009. It uses a unique operating system known as the Blink, which features a small, gas-efficient piston. The A400 Xplor Unico boasts the ability to shoot any shell, including the ultra-heavy 3.5-inch magnums. Even better, you don’t need to adjust it every time you want to shoot a different shell. Regarding appearance, the A400 Xplor Unico sports a laser checkered exterior that’s enforced by a very strong aluminum alloy. It comes in blue, green, camo-clad, black, or bronze colors. It’s price between $1,450 and $1,550. Like a true Beretta gun, the Silver Pigeon I Sporting comes with perfect trim lines and outstanding pointing qualities. Compared to other more expensive offerings in Beretta’s 680 series, the Silver Pigeon I is more reasonably priced and only lacks a few decorative features. 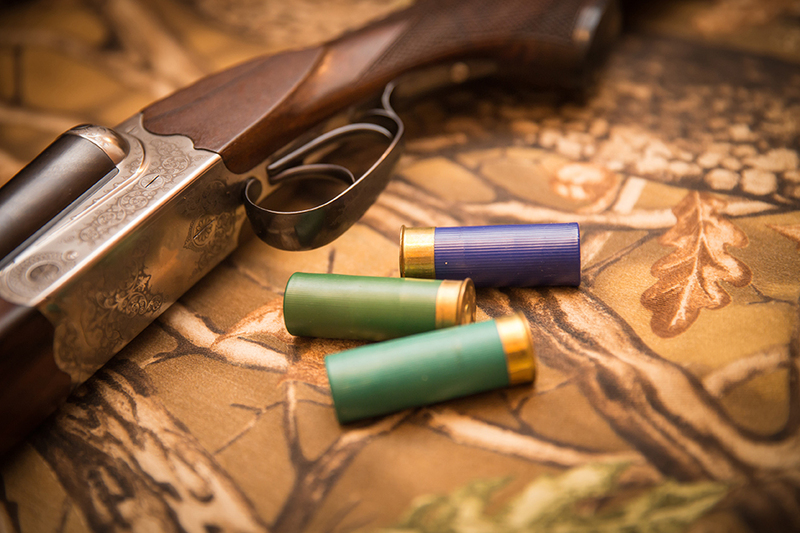 It delivers a solid action that locks up nicely even after hundreds of rounds, and this is probably why it’s so popular with target shooters and hunters. It also has great looks, courtesy of the engraved scroll and the American walnut-like wood that complements its silver receiver. The Silver Pigeon costs between $2,100 and $2,200. The Beretta DT 11 is a clay target shooting shotgun that has won numerous world titles. It features a heavier and more rugged action than its predecessor, the Beretta DT 10. The DT 11’s barrels are Beretta’s patented “steelium” alloy that is very durable. Thanks to its persistently tapering bore, shooters can now use less choke without experiencing any changes in their results. To make maintenance and replacement of worn out parts easier, Beretta designed the DT 11 with rugged crossbolt lock-ups, detachable trunnion barrel pivots, and a replaceable trigger. The price for a DT 11 runs higher than the other shotguns on our list, priced between $8,600 and $11,000. Famously dubbed “the Blue Gun,” the Beretta A400 Xcel is a popular choice among staunch clay sporting shooters who prefer semi-automatic shotguns. This masterpiece is easy to maintain and can serve you for a long time before it needs cleaning. Generally, in the world of semi-auto shotguns, no piece is malfunction-free. However, the A400 Xcel is darned close to perfection because it rarely fails to fire. Moreover, its recoil is as soft as it can get, thanks to the perfect combination of a gas-operated feature and the voluntary “Kick-Off” recoil reducer. The A400 Xcel comes with a balance magazine cap, which allows you to add or reduce the shotgun’s weight for a more balanced shooting experience. It’s also fitted with stock shims that allow you to adjust the stock fit of your gun to your liking. The A400 Xcel costs around $1,600 to $2,700. The A400 Xtreme Max 5 is a well-rounded shotgun that can be for multiple challenges. It’s powerful, comfortable, compact, and reliability. The Max 5 can also shoot any 12-gauge ammo, from 24 to 64-gram rounds. For durability, all the internal parts of the A400 Xtreme Max 5 come with various rust-proof coatings. The trigger, slide, and carrier are coated with anti-glare treatment, while the barrel bore has a chrome coating. The receiver is also anodized aluminum for maximum corrosion resistance. In terms of performance, the Max 5 doesn’t disappoint. It features a micro-core for a smooth and soft shooting experience. It’s also light and easy to carry around and has the Berretta’s Blink technology for its gas-operated mechanism. And, the gun’s B-lock cap system offers an instant lock — you only need to rotate the cap 60-degrees. The A400 Xtreme Max 5 will cost you between $1,900 and $2,000. As with most guns, different shotguns suit different people and purposes. As a rule of thumb, always consider what you intend to use the shotgun for before buying it. That will help you choose what to prioritize concerning gauge, action, balance, weight, and finish. If you are not well versed with what terms like action and gauge, have an expert explain them to you before you whip out your wallet. And take care in handling your newly found favorite shotgun.